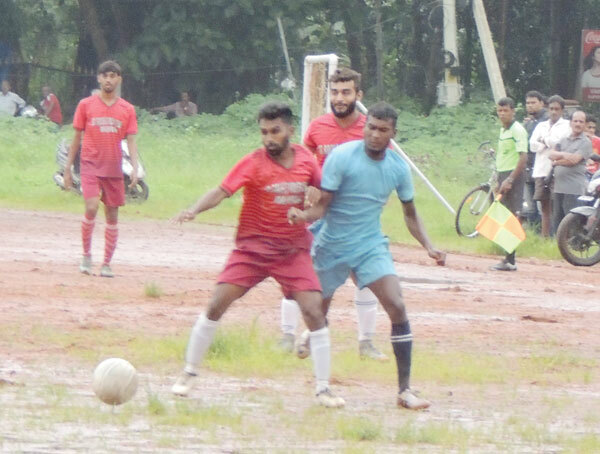 BENAULIM: Margao SC shot-out St Rock YC, Majorda 6-5 via the tie-breaker to move into the final of the 22nd Dando Boys Cup football tournament organised by Dando Boys Club, Benaulim, at Sao Joao Baptist ground, Dando-Benaulim, on Tuesday. The first best chance of the match fell to St Rock striker John Mendes in the 4th minute who after taking control of the ball from midfielder Wendell Coelho and dribbled past Margao defender Valito Miranda and shot from the edge of the box but the Margao keeper Swizel Pereira was equal to the task. Two minutes later, Margao through Christopher Borges should have netted but the latter’s long ranger was saved by St Rock keeper Rolland Fernandes. The deadlock was broken by St Rock striker John Mendes with a penalty kick in the 25th minute. Seven minutes later, Margao SC equalised through Joel Colaco. In the resultant tie-breaker, Margao SC netted through Alfred Noronha, Roque Borges, Valito Miranda, Clencio Pinto and Kevin Araujo while John Mendes, Kevin Almeida, Josley Dias and Roger Pereira for St Rock YC, Majorda.